I admit, Torri del Benaco on the east coast of Lago di Garda (Lake Garda, Italy) was not our first choice. We had been planning on a few days in Venice before crossing the border into Slovenia and on to Croatia. But a heat wave took hold. Day after day of 100+ degrees traveling on the motorcycle was getting old, and frankly, no fun. The thought of Venice and all the crowds and smells in such thick summer heat didn’t sit well with us. So I did a quick weather search followed by a hotel search. We came up with a number of towns that would only be an early morning ride from Modena, Italy. Criteria: a few degrees cooler, had both pool and ac, and a walkable town for two days of no moto. Torri del Benaco fit the bill. Located on the east side, where you could say is the ehhm shaft of the phallic shaped Lake Garda, Torri del Benaco is less congested than the other towns. It does not boast the major tourist sites of the lake. It does have a ferry service that connects visitors with those that do. The historic center is surrounded by fortress walls and features a castle, Il Castello Scaligero. We walked down the steep hill from our rental condo and crossed the busy traffic on the main road and into the historical center of the city. It was hot, and even during dusk, we were sweating standing still. So, like any sane person, we opted for gelato instead of dinner. The castle stood on one side of the U-shaped harbor, and restaurants and cafes the other. The center of town felt oddly fake and yet utterly real. Locations like this are where Disney gets inspiration from. 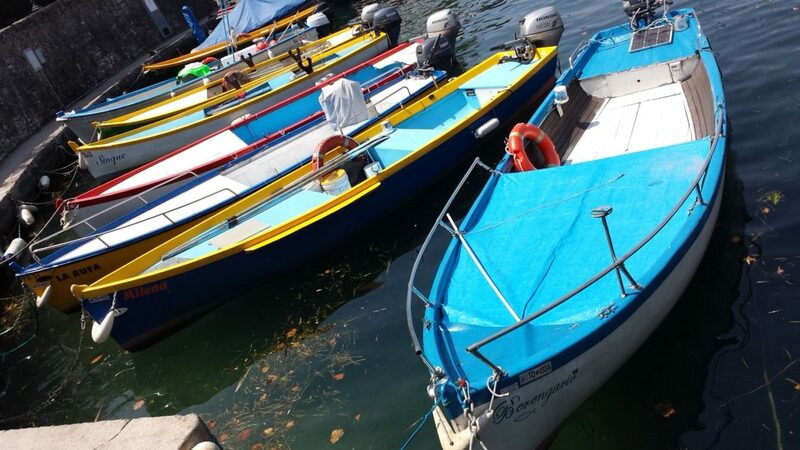 The clean hues of blue, yellow, and crisp white adorned the dinghy fishing boats. They seemed to hover above the lake which was clear and almost had a mint green tint from years of rain and runoff filtering through the chalky mountains. A vast stretch of pedestrian pathway separated the tables situated along the water’s edge from their restaurants and cafes. Waiters dodged in and out of the strolling people trying to get libations and delicacies to the tables. They too were soaking with sweat. We picked our cafe and grabbed a seat. The sun was setting over the mountain opposite us, and the sky and water became one in zebra stripes of pinks, oranges, and yellows. Across the promenade, under a portico, a woman played a double tired keyboard on the accordion setting. Her mop of silver hair swept back and forth across her forehead and cheeks, soaking up the sweat as she excitedly serenaded the German and Austrian tourists. Largo di Garda had been their lake of choice for generations of getaways. A few older couples were dancing with slow, sluggish movement and happy-had-too-many-drinks-smiles. I can’t for the life of me remember the American song playing, but it was a lite rock of the love song type from my childhood, reinvented with a German accent. We were living in the middle of the credit roll from a 1980’s B rated movie.